Temple Israel’s Elaine Gastwirt College Outreach Fund was established in 1991 by the Gastwirt family in loving memory of Elaine Gastwirt. The purpose of the fund, then and now, was to enable the Temple to stay connected with its college students by reaching out to them throughout the school year with special mailings and care packages. It is intended as a way for the Temple to communicate to our college children that the Temple has not forgotten them, and continues to consider them a part of the Temple Israel community. Packages are sent by the Temple’s Youth Committee at Chanukah, Purim, and Passover, depending upon when the holidays fall in the secular calendar. Packages and participation are free. This year we have over 70 students participating! Elaine Gastwirt (1938-1990) was an active member of the Temple Israel community. She was deeply concerned with Jewish youth, and put much energy into planning and sustaining the activities of the Temple Israel Youth Group. Her three children Leslie, Richard and Allison, each served as presidents of the Temple Youth Group in the mid-1980s, with Elaine’s encouragement and support. Continuing the tradition, Elaine’s grandson Oren, 16, Leslie’s son, is president of the United Synagogue Youth chapter in Framingham, MA. The Elaine Gastwirt College Outreach Fund stands as an especially fitting memorial to Elaine’s caring nature and strong interest in strengthening the Jewish consciousness of our young people. 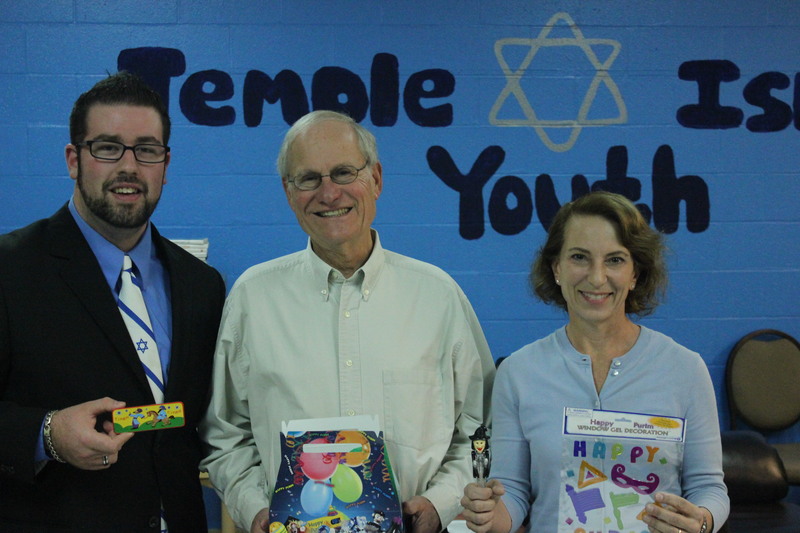 Pictured: Bryan Bierman, Program Director, Larry Gastwirt, husband of Elaine Gastwirt, and Karen Kleine, Youth Committee Chair posing with items from a care package. If you are interested in signing your college student up to receive a college box, please contact Director of Youth Engagement, Jordyn Kay at jkay@tiwestport.org. Please also remember the Elaine Gastwirt College Outreach Fund when making tribute contributions to the Temple. Your support of this activity would be greatly appreciated. Thank you.